I am a Disciples of Christ pastor, church historian, and author. I currently serve as Pastor of Central Woodward Christian Church (Disciples of Christ) of Troy, Michigan. As a writer, I have authored several books, as well as numerous articles and book reviews. I was a contributor to the Oxford Dictionary of National Biography and have written for such journals as Church History, Anglican and Episcopal History, Progressive Christian, Christian Century and Congregations. I am the current editor of Sharing the Practice (Academy of Parish Clergy) and among the books already published, I have a number of books that have appeared with Energion Publications -- Marriage in Interesting Times: A Participatory Study Guide, Unfettered Spirit: Spiritual Gifts for a New Great Awakening, Worshiping with Charles Darwin, Ultimate Allegiance: The Subversive Nature of the Lord's Prayer and Ephesians: A Participatory Study Guide, and Faith in the Public Square (2012). I'm also editing a new series of books for the Academy of Parish Clergy entitled Conversations in Ministry. I'm also the author of Freedom in Covenant (Wipf and Stock, 2015). For more on my books, see my Amazon Author Page: amazon.com/author/robertcornwall. Education wise I hold a Ph.D. in Historical Theology from Fuller Theological Seminary, along with an M.Div. from Fuller and a B.S. degree from Northwest Christian University in Eugene, OR. As you will see from the contents of this blog, together with my other writings, I have a strong interest in theology, the church, the ecumenical movement, interfaith dialogue, and politics. Regarding my ecumenical and interfaith ministry, I currently serve as Chair of the Commission on Ministry for the Christian Church (Disciples of Christ) in Michigan and a Chaplain for the Troy Police Department. I also served as Convener of the Troy-area Interfaith Group, President of the Metro Coalition of Congregations, which has become DRIVE (Detroit Regional Interfaith Voice for Equity). 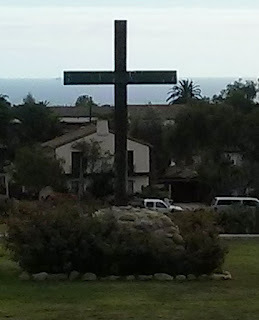 Before coming to Michigan, I served as President of the Greater Santa Barbara Clergy Association, the University Religious Conference at UCSB, and was founding convener of the Lompoc Interfaith Group.